Dee Asks: Where Are You Staying Stuck In Your Creative Journey? Thanks a lot, Dee, for getting all up in my business. 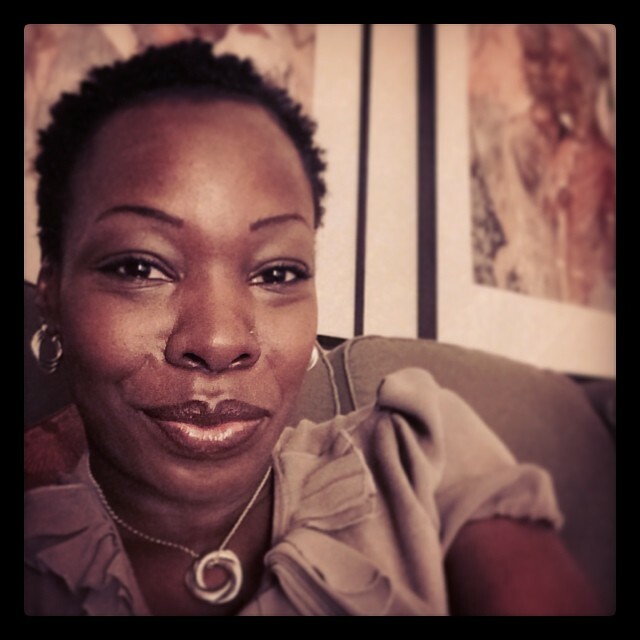 Dee, is Denitra Letrice, writer, vlogger, and blog author of Thoughts From The Blue Notebook. I met Dee, who is from my home state of Connecticut, through a mutual friend on Facebook, Kelly Quinn. And, right from the start, I knew I was going to like this woman. She is simply hilarious, with quips so fast and funny I can’t ever really keep up with her–though I appreciate our mostly silly back-and-forth banter spurred by Dee’s declaration of it fairly often being time for roller skates, leg warmers and glitter–there’s always plenty of glitter. It seems in one of her videos Dee received an epiphany after a talk with her nephew, and decided to, moving forward, focus her blog on collaborating with other writers, creatives, and readers by posting a weekly prompt on Tuesdays for folks to respond to, followed by a vlog the next day, and her own post response to the prompt on Thursdays. All can contribute by posting their responses either directly in the Comments section under Dee’s Thursday post, and/or link to their response on their own blog, video or website, also in the Comments section. And, she’s right. I bristled. I didn’t want to answer. I wanted to wallow a little bit, and not respond and put off writing a post just for one more day. See, I’ve been in a bit of a slump here; not posting as much these past two months as I have in the past. I’ve fallen off the discipline wagon. I don’t believe in writers’ block. I don’t want to believe in it. But, I am a bit stuck. With the blog, I know recently I started getting this feeling that I was getting pulled in different directions–sometimes thinking I had to address all the very serious matters that were going on in the world related to race and racism. I also think from reading my Twitter feed where I follow many people of color who speak on race (see my piece linked to on The Root on surfing Black Twitter here) tweets can get pretty down on white people, and speak often to white privilege, that it gets hard at times to feel like whatever I might say will be wrong, or coming from this place of privilege, or that I just don’t get it, or that…and on and on. It’s time to get back on that discipline wagon, and just get ‘er done. That way, Dee will stop getting all up in my business. So, thanks a lot Dee, for making me get all personal and stuff–but seriously, thank you for your collaborative spirit, and for making us all think about what is getting in the way of our creative journeys. I can’t wait to read the other responses. I think it’s time to put those roller skates on…glitter, please! Glad you’re getting your glitter on! oh yes, Vickie! me too. Thanks for reading! Hi, there, Wendy Jane! I love so this great blog post article of yours! It is so nice and cool to read another of your very fine, excellent, and progressive blog post articles! I so enjoy them so, so very much! Thank-you so for providing the info and link on this marvelous and inspirational vlogger, Dee! She is so positive and optimistic! I feel so incredibly inspired by her! I like how you and Dee share about your children. I love children1 I wish that it had been feasible for me to have children. I don’t have any children. As a lesbian woman, because of my sexual orientation and not being involved with a man I couldn’t have children. I, too, try so hard to be perfect in my writings! In my creative writings and poems I have not often shared with other people because I fear not being perfect at it. In my journals I feel that I have to write the perfect way or it won’t be as good. I am learning, though, and gaining in my self-confidence. I am so glad that you are as usual continuing to get your glitter on (SMILE!!!!!!) Your friend is so right when she said, “See that we’re all in this together.” How so very true! Wendy Jane, I think that you don’t have to be perfect in your writings and as and how you express your love, caring, and outreach to black people and other people! You don’t have to be perfect in your thoughts, words, and analysis on race, racism, white privilege, and in your true and sincere love for black people and others! You can only do your best and you are for sure learning so well and so eagerly as you go, Wendy Jane! I truly appreciate you and your great love for us so, so very much! It means a whole lot! I, too, am going to try to do as Dee says and not stand on my own cape! I am growing as I get older and have become more daring and more self-confident! Dee is just marvelous and she really got me thinking, too! Wendy Jane, I say as the black woman who I am that you are indeed a true sister to me and us as black people and other people! I am so eagerly anticipating more of your spectacular writings! I am very interested in learning more and reading your poems and your memoir, and other writings! Thank-you so, so much for this honest and sensitive sharing of yours! Wendy Jane, you please have a very nice, special, and a blessed, Thursday! Well, this time you brought tears to my eyes. I am glad that you are inspired, too, by the wonderful, Dee. She is something else–and I didn’t even know that you wrote, too, and would love to see some of your poetry or other writing any time you want to share it. Thank you for being so honest about your own writing process, and your pursuit of perfection–that can hold us back for sure, and you are not alone there. Even though you don’t have children of your own, you are such a warm person that I bet you are a great aunt if your siblings have children, or just good with kids in general. Stay well, my sister, and enjoy your weekend. Now both you and Dee KNOW I’m no wroter( lol!) but I just realized I being to this beautiful table: connection! I am so blessed to know these souls who are deep and reflective and uber talented. You writing folk speak for me and in return, I can connect you to each other. Symbiosis. That’s the word, right? I am honored to be a part of this circle. Yes, you belong…right alongside us. You are the connector for so many people, and you do have a beautiful voice with your written word, too, so please know that. I feel so blessed, too, to have met you here, a Waterbury gal, alas a little younger than me, and from that OTHER high school, and to have met so many wonderful people through you. yes to symbiosis! And…the honor is all mine.